From a one-off garden clearance to a monthly garden maintenance package to keep it looking tidy, Handyman Manchester is here to help you with your garden. Whether you have just moved in and want a load of rubbish removing and all the plants and hedges cutting back or just want the lawn cutting every fortnight then that is fine by us. We are also happy to take on other gardening jobs around your garden. 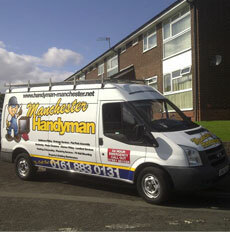 Whatever outdoor jobs you want doing then our Manchester Handyman is happy to help. If we require any skips or need to pay for any waste disposal then we will include this in our price so you know the total amount it is going to cost. Rocking flags, broken gates, damaged fences and moss-covered paths are everyday occurrences, especially over the winter time with the bad weather. Our Manchester handyman is happy to come and put these things right making your home safer, more secure and a nicer place to be around whether you are staying there yourself or preparing it ready for sale. Whether your house is in Wythenshawe, Beswick, Prestwich or Rochdale, Our Handyman is happy to anywhere within the Greater Manchester region to give you a fixed price quote for any garden maintenance or repair work you require.